JS Hayes now distribute a range of Chemform products that are highly suitable for the Facilities Management industry. The Sapphire Concentrate Range is safe and easy to use with the added benefit of safety inserts, minimising contact with the product and eliminating waste. All Sapphire Concentrate labels contain readily accessible safety information with their precautions for use and first aid. 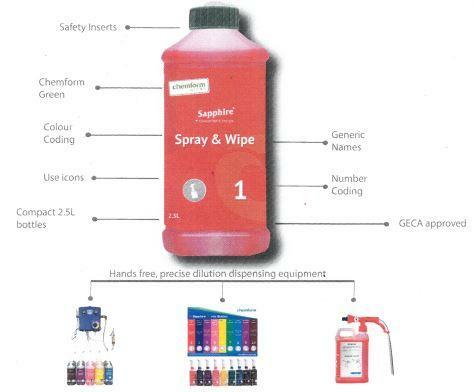 The Sapphire range is available in 2.5L concentrate and 750mL Ready To Use containers and is GECA approved. With Chemform's dispensing system, this eliminates waste while giving precise dilution for optimum performance saving you time, money and improving OH&S.